The Oil States QCS Emergency Pipeline Repair System (EPRS) is a complete package of products designed to get damaged pipelines back up and operating quickly. A typical repair scenario, where the existing pipe has flanged ends, consists of two FlangeMate (FMF) misalignment connectors and a joining spoolpiece. The FMF provides both bolt-hole alignment and angular adjustment to 10° per connector. Where pipe ends are not flanged or have been cut and prepped, adding Oil States QCS GripLock connectors restores a flanged attachment point for the FlangeMate connector and spoolpiece. 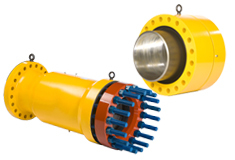 The GripLock connector maintains a structural connection with the pipeline by securely holding the pipe with collet grips. Complete package of field-proven products can be installed quickly, on site, with customer-supplied spoolpiece. FlangeMate fitting offers bolt-hole alignment, angular adjustment to 10° per connector, metal-to-metal sealing and annulus seal test feature. GripLock connector offers single-set grip and seal actuation, dual-barrier Viton seals, reversible collet grips and annulus seal test feature. Available with or without GripLock connectors. Sizes to 24″ in stock for quick turnaround. Offshore technicians available to assist with installation. See ball flange animation here.